The large oak tree swayed as a gentle breeze trickled through its branches, revealing a bird’s nest. Poking its little head out for the first time was a baby robin stretching its beak for food. His belly was grumbling and he instinctively knew his mother was seconds away. “Having a sense that good things come from mothers is what everyone longs for,” thought Joey as he stepped back from the orphanage window. He had watched the robin wait patiently for her little ones to hatch and then took off to capture their first meal. He longed for that same patience, but found that the older he got, the fewer and farther between were his visits with potential parents. “Why did adopting parents always gravitate toward the quiet and cute little girls?” Joey asked himself. He knew his cynicism was on the rise and something needed to be done before his meeting with the first couple he had seen in three months. Oh, he could put on a show if need be, but surging through his 12 year old frame was a passion for being authentic. Joey was desperate for a home, but his conscience wouldn’t allow him to live a life of lies or pretense. Nor did his questioning spirit want to get in line with the sugary sweetness that most desired. He was growing into manhood and desired to live like the man he wanted to be. After all, the teen years for Joey were all about practicing for manhood. Joey walked back over to the window and watched the mother bird feed her young. He realized that the little bird was well taken care of and had a place to stay – A sanctuary of sorts. Joey gently bit his bottom lip and acknowledged his thankfulness for the orphanage. He laughed at the thought that one day he too would fly the coop. Future career ideas and hobbies flowed through Joey’s mind. Within minutes he was filled with joy and looking forward to what might be ahead. An early knock on the door snapped Joey out of his dream. It was time to meet another prospective family. The living area was appropriately appointed for a room used to acquire donations from all who entered. It was a simple room with little to offer except for an over stuffed chair that men typically plopped into and a Victorian coach for the women or children paying a visit. The orphanage director sat in an upright chair moved into place from the dinning room. Ms. Claire Wilson, the director for the past 17 years, shared her rehearsed welcome with the Snyders. Two small girls sat quietly with their hands folded nicely on their laps, as if their behavior might determine how long they stayed in the facility. Mr. Snyder was running his hand across the well-worn leather upholstery and Mrs. Snyder was paying devote attention to every word. “And, that is why I feel Joey would be a good fit for your family,” concluded Claire. “Oh, yes, I can certainly see that,” remarked Mrs. Snyder. “What about chores?” insisted Mr. Snyder. “In what way do you ask, sir?” questioned Claire. “There is nothing wrong with you requiring Joey to help out around the house and no one will come after you for breaking child labor laws,” affirmed Claire. All eyes turned toward Joey as he entered the room. He looked cute as he carefully stepped toward Mrs. Snyder like a shy little boy. He stopped in his tracks. He couldn’t play that game, especially since it wasn’t his style. He only wanted a family that would love him for who he was, not based on their fantasy developed from too much TV. The two little girls looked up at Joey with a smile on their face. Mr. Snyder raised an eyebrow and looked Joey in the eyes. Claire shot Joey a look. Joey recognized the signal for him to settle down. He knew that the director was tired of his rambunctious attitude around the orphanage. He also knew that he’d receive another whooping if he blew it again, although she wouldn’t care if he messed up after arriving at his new home. Joey’s eyes lit up. Did he hear it right? Was Mr. Snyder interested in him, not a cutie who was sure to capture the heart of a mom? The owner patted Joey on the back, as they headed inside. Hours into the party, people chatted around every table, while a jazz band filled the air with joyful sounds. Off to the side stood Joey, peering out the big picture window over looking the bird sanctuary. Mr. Snyder came along side of him. A robin flew into view and landed on the branch Joey was pointing at. 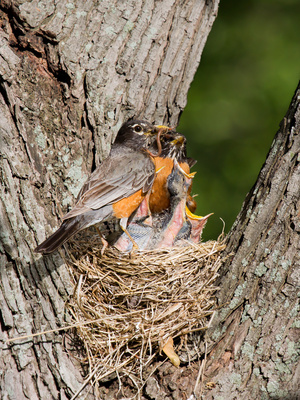 Little baby birds lifted their beaks out of a nest, as the mother bird fed them a worm. “Another generation of blessings,” smiled Joey. “This place was my sanctuary for a time, but I’m so happy you decided to love me,” Joey spoke in a soft voice. “A sanctuary of memories,” Joey mused. CJ, you have a knack for writing a diversity of categories and styles. This short story is another example of luring and keeping interest while offering a sweet surprise at the end. Will be sharing your stories and looking forward to your upcoming short-story book!